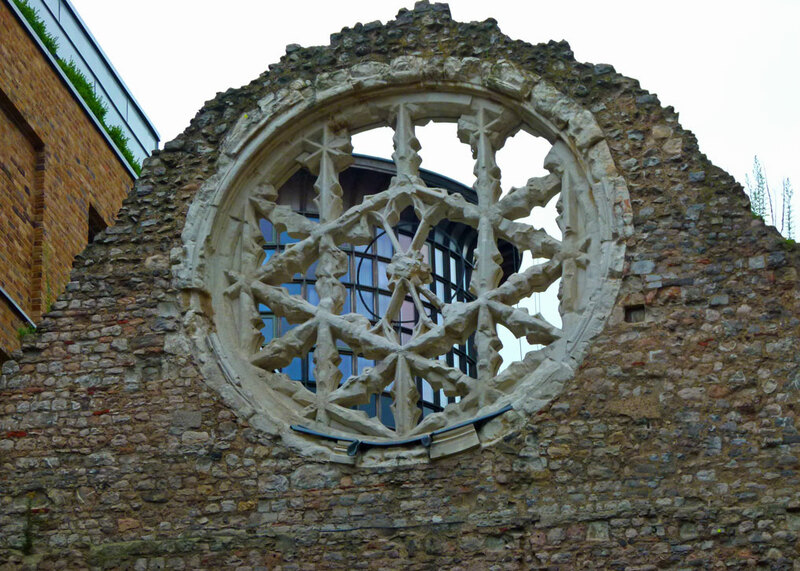 Here’s a thing: you’re strolling along by the Thames at Southwark in search of a pint when you suddenly come across some ruins; you look closer and, high up on one its remaining walls, is a beautiful rose window. Most folk pass it by, either because they don’t notice it, or because it’s just another wrecked, old, building; others stop and look at the plaque that announces this is all that is left of Winchester Palace. And you’re wondering – of course you are – why it’s nowhere near the county town of Hampshire, once capital of Alfred’s Wessex, but instead on London’s swarming south bank. That’s because this is where the medieval Bishops of Winchester had their London pad; close to where the action was and, as many of our episcopal friends held high offices of state, a place of some importance. It’s odd to think that this was once a focal point, that things happened here, powerful officials used to come and go and famous people visited. We know, for example, that Thomas a Becket popped in to Winchester Palace on his way to Canterbury in 1170, where he was murdered shortly afterwards. Simon de Montfort, who rebelled against his king and was slain at the Battle of Evesham in 1265, lodged here. Grand feasts were held in the great hall (which is the only bit of the palace remaining) including the wedding feast of King James I of Scotland and his young English bride, the 20-year old Joan Beaufort, in 1424. 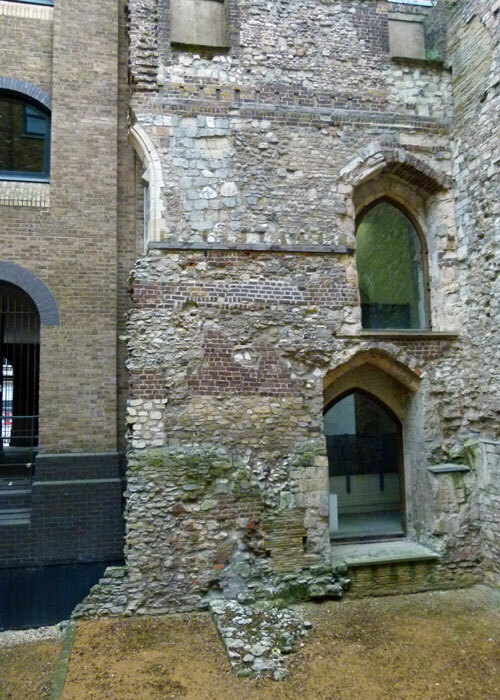 James and Joan – a love-match, apparently – were married in what is now Southwark Cathedral, a short walk to the east. Southwark was far more relaxed than the rigidly controlled walled City of London just across the river. In Southwark, you could have a Good Time…there were bear pits, taverns, theatres and, apparently licensed by the bishop in an altruistic attempt to keep men from worse sins, brothels – known as ‘stews’. The girls who plied their trade were tagged, ‘Winchester Geese’ – maybe because long necks were considered attractive. Many of the ladies died young and probably ended up in unmarked paupers’ graves – possibly in Cross Bones Graveyard, a piece of unconsecrated ground near Borough High Street; many would have had venereal disease – syphilis, in particular. And if you caused a problem with any of the prostitutes in this place of whoredom, maybe had a little too much ale, or owed the wrong person some money, you could be thrown into the Palace’s very own prison, the Clink, ‘the prison that gave its name to all others’. 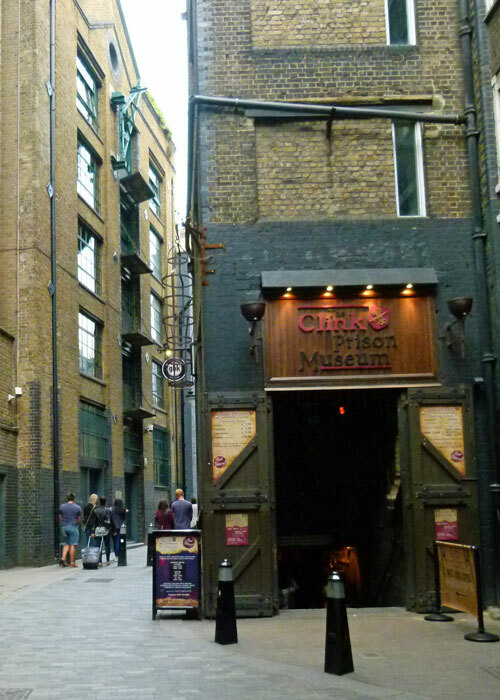 There is a museum paying homage to the Clink on its original site, a few steps from the remains of the Palace’s enormous great hall. The Bishopric of Winchester was granted the land hereabouts, which became known as ‘The Bishop of Winchester’s Liberty’ (later ‘The Clink’s Liberty) in the 12th century. William Gifford, Bishop of Winchester, built a house on the site in 1117, but the Palace was founded by Henry de Blois, younger brother of King Stephen, and William Gifford’s successor. These were powerful people; Henry, for example, was also Abbot of Glastonbury and one of the wealthiest men in the kingdom. It is extremely difficult to picture London’s Bankside as the pastoral area it once was, with cattle grazing in meadows, trees and gardens. In the Tudor period, the dwindling open ground had become known as the Bishop of Winchester’s Park, but it was all gradually built on over succeeding centuries. The Palace itself declined from the mid 16th century, though remained in use until the 17th, after which it was divided into tenements and warehouses. A fire in 1814 destroyed much of it and the little that remained got hidden as a warehouse was erected around it. 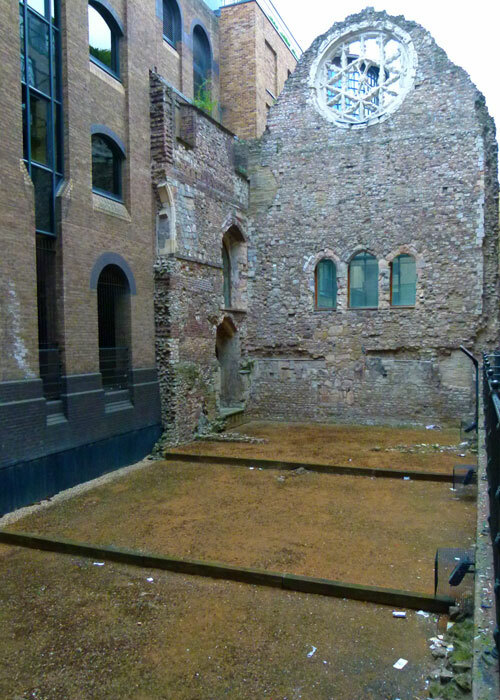 The ruins were rediscovered when the warehouse was bombed during London’s Blitz, before being finally revealed during redevelopment in the 1980s. And there they are today, a trifle incongruous amongst the modern buildings that jostle them in. Check out Winchester Palace and other places on A Bit About Britain’s attraction directory. It’s hard to imagine from my point of view, here on a rock in the Pacific northwest, a walk that would take me stumbling across such a remarkable site. Lucky you! When I read things like this I miss our years in Germany. Rocks, surf and trees are fine, but…………. Hi Mike – such a great area to look around – I’ve been remiss, but perhaps now I’ve had my hip op … I can more easily walk around – and you’ve ignited my interest. Rose windows are incredible in construction … and perhaps the bombing did some good? I remember a tv programme on the excavations of the Cross Bones graveyard … they might have been searching for some notables bones – but in doing so … did some archaeology. I am glad this little bit of history has been preserved. Even as a ruin- that palace wall’s a beauty. Just stayed in Southwark and visited some of these places. The Clink was enough to scare you straight. All the layers of construction … and layers of history preserved. How amazing that after all these years and all that London history, a bit of the palace is still standing, how beautiful that old rose window that has looked out on all those years. I first became aware of the Cross Bones graveyard when I read about a campaign that was underway to save it. I’m guessing that campaign was successful? And ‘Winchester Geese’. Such a poetic reference to the girls who plied their trade. It’s a miracle that this much of the palace is still standing.